IMPORTANT NOTE FOR BROADCAST DELIVERABLES: Please note that the encoding service is intended for use cases like offline file sharing, kiosk video displays etc and not intended for broadcast deliverables. For broadcast deliverables, please download a closed caption file from your 3Play Media account and encode the captions outside of the account system using encoding software like Handbrake, Apple Compressor, or Adobe Media Encoder. 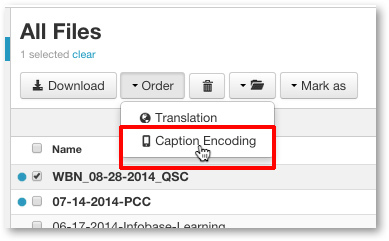 After your file has been transcribed or aligned by 3Play Media you have 60 days to order a captions-encoded video. Once the captions are encoded, the video can then be downloaded directly from your 3Play account. Note: Upon completion, you will have 60 days to download the video with the encoded captions from your account. Once the transcription or alignment process is complete for your file, follow the steps below to get started. PRO TIP: Proofread the transcript before ordering encoded captions and make any desired edits before placing your order! 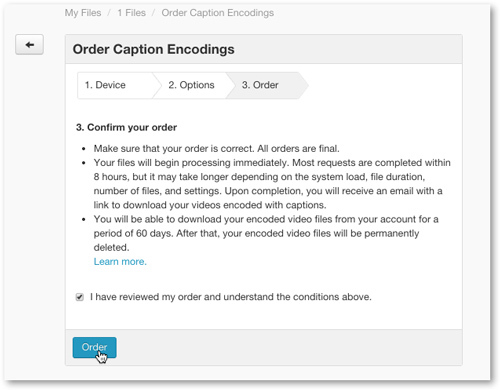 Check the box next to the file you want to order a caption-encoded video for. Multiple files can be selected for your order. Click Order located above the list of files. 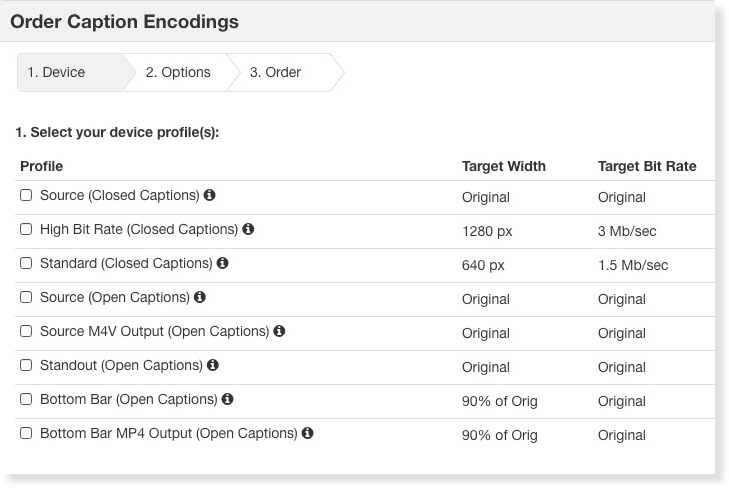 From the drop-down menu that appears under Options, select Caption Encoding. After clicking Order Caption Encoding, a pop-up menu will appear. Check the box next to the encoding profile(s) you would like to order. An individual file can be encoded in multiple formats but note that your account will be charged for each profile selected. NOTE: If you choose Source Settings, 3Play will encode the closed captions in an m4v file which has exactly the same specs as the original video that was uploaded for transcription/captioning or alignment services. So, in this case, you should be sure that the source video has the quality that you desire. After you have made your selections, click Next. If the English transcript has been translated into other languages, select the languages you wish to have included in the encoded video. Note: In step 4 if any Open Captions were selected only one language can be included in the encoding request. Next review your order before submitting it. Check the box to confirm that you have reviewed your order and understand that you will have 60 days to download the caption encoded video. Once you have reviewed your request, click Order.